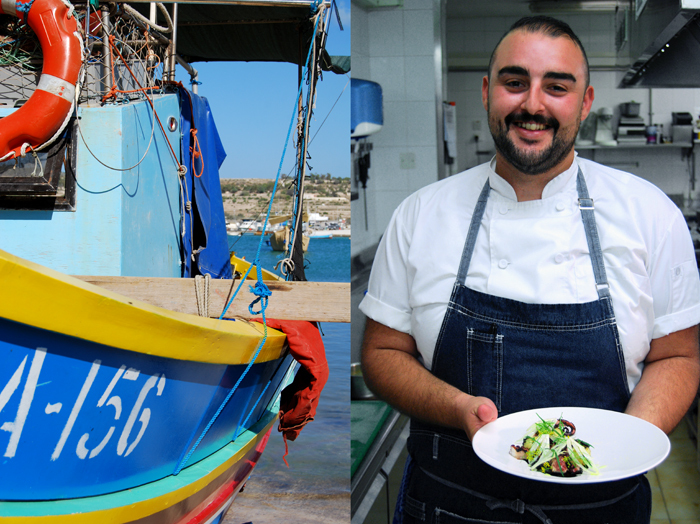 A couple days ago I met a rising star of the Maltese cooking scene, Kurt Micallef, in the kitchen of one of Malta’s best fish-centric restaurants, Tartarun in Marsaxlokk. Kurt has been at the top of my list of chefs to meet for quite a while, I’ve heard so much about his work that I got in touch with him as soon as my flights were booked! We decided to transfer the meet in your kitchen feature to his work space at Tartarun as this is the kitchen where he spends most of his time cooking and working on new creations. 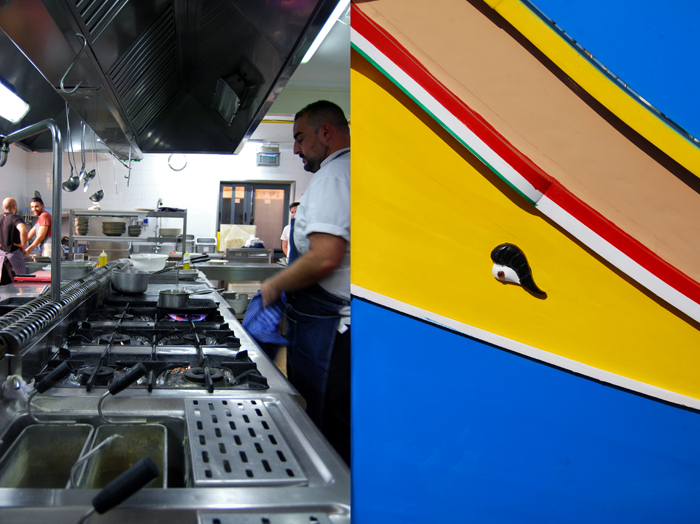 Kurt grew up in Malta in a family of butchers in the third generation but decided to start a career as a chef. He moved to London, where he studied and gathered experiences in a couple Michelin starred restaurants. However, he found his biggest inspiration at In De Wulf in Belgium, a renowned restaurant where the philosphy is to use local produce and work with traditional methods of cooking combined with a modern presentation. Simple but refined, this is the culinary style he can relate to. 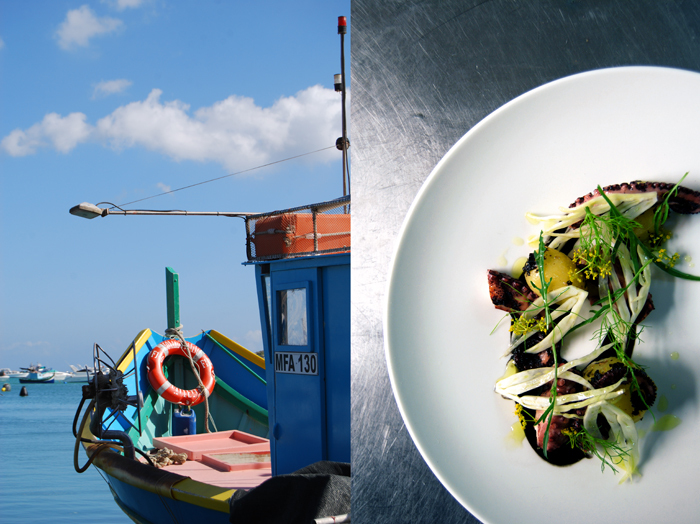 For eat in my kitchen, he chose to share a wonderful composition of his which focuses on two of Malta’s most present flavours, seafood and fennel. He combines slightly smokey octopus which he first cooked in broth before he char grilled it with compressed fennel bulb, potatoes cooked with Kombu, squid ink emulsion and fennel flowers and fronds. 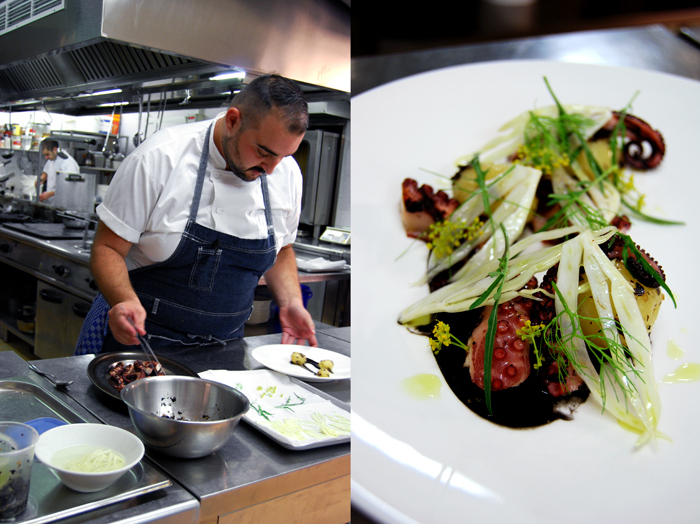 I was so impressed by the meal that Kurt created for us, the smokey octopus and strong fennel aroma are a perfect match and I will definitely use it in my own kitchen! Make a stock with the onions, garlic, lemons, fennel seeds, star anise and water. When the desired flavour is achieved add the octopus and simmer for 40 minutes or until tender but not stringy. Leave to cool in the cooking liquor. Remove octopus and break down into separate tentacles. Reserve the octopus and cooking liquor for later use. Combine the fennel fronds and grapeseed oil in a blender and blend until smooth. Transfer to a pan and bring to 60 degrees. Remove from the heat, cover with cling film and leave to infuse for 1 hour. Pass the oil through a chinois lined with Muslin Cloth. The oil should be clear with a green hue and fennel flavor. Slice the fennel bulb lengthwise on a mandolin into 2mm thick slices. Trim the root off and transfer to a vacuum bag with the oil and juices. Compress and leave to marinate for 10 minutes. Drain on paper towels and season lightly with salt. In a pan bring the water to 60 degrees, add the kombu and simmer for 20 minutes. Discard the Kombu and add the potatoes, cook until done, approx. 15 – 20 minutes. Remove from pan and leave to cool slightly. Peel the skins from the potatoes and reserve for later use. In a bowl, combine all the ingredients and whisk until emulsified, adjust seasoning and reserve for later use. Combine the shallot, onion and garlic in a pan, cover with oil and place on low heat. Cover with a cartouche and cook for 15 minutes until tender. Meanwhile toast the nori over an open flame until it changes color. Remove the onion mixture off the heat, add the nori and cover with cling film. Leave for 1 hour to infuse. Drain mixture reserving the oil. Chop the onion mixture into a paste and season well with lemon zest, add enough oil to the mixture to bind. Reserve for service. Lightly drizzle the octopus with grapeseed oil and season with salt. 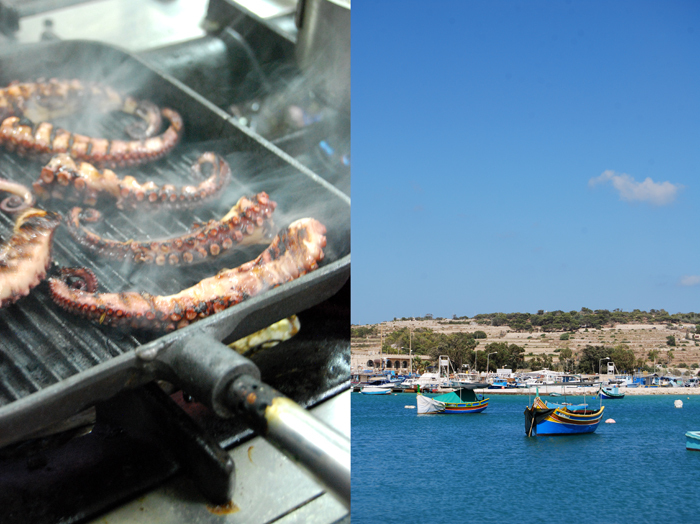 Grill the octopus on a charcoal bbq or a grill until lightly charred and a smoky taste is obtained. In a bowl combine the potatoes with the seaweed paste until nicely coated. Smear the squid emulsion in the centre of the plate. Build the composition with the octopus and compressed fennel on the squid ink emulsion, add 3 potatoes and garnish with the fronds and flowers. You studied French Cuisine at Le Cordon Bleu in London, what moved you to start your culinary education in London? I did my Diploma in Cuisine at Le Cordon Bleu in London. The diploma was only 9 months long and this was a major factor I took into consideration when I chose the diploma. I decided to become a chef at the age of 22, which is considered as already being too late for the industry. Another factor was that it is considered to be one of the best culinary schools in the world, which provides you with solid fundamental skills in the kitchen. This gave me a good foundation. I later developed further skills by working in different kitchens around London. You worked at several Michelin starred restaurants, which one influenced your cooking the most and why? During my year studying in London, I staged (apprenticed) in a couple of Michelin starred kitchens to continue learning and developing myself as a chef. However, the greatest influence was brought forward through a two month internship at In De Wulf in Dranouter, Belgium. This is a 1 Michelin starred restaurant with a unique concept. The chef there, Kobe Desramaults, took over his mother’s restaurant which was a casual brasserie in the middle of nowhere, for travellers going back and forth from France to Belgium. He revamped the restaurant and focused on doing high end food, using local produce from neighbouring villages. 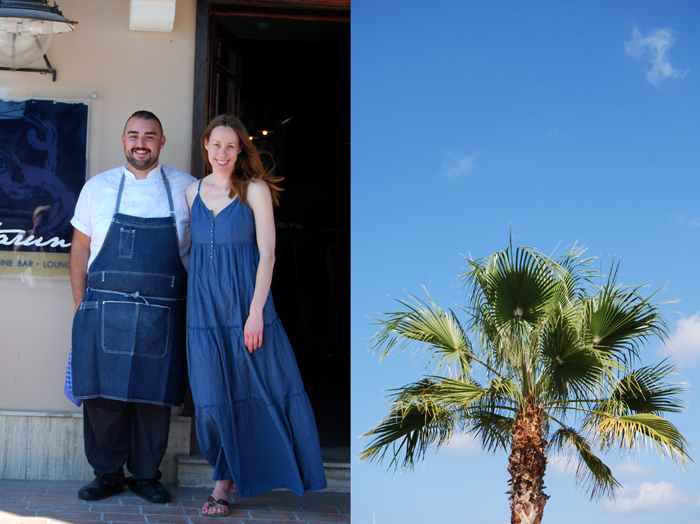 The philosophy of the restaurant is that of being local and using nature as inspiration. They focus on an old style of cooking, but present it in a modern way. The use of wood burning ovens, smoking, foraging, pickling and fermenting was something new to me, and this really inspired me. I fell in love with the food there; it was so simple yet so refined. I knew this was the kind of food that I wanted to cook. I returned back for another 2 month stage the year after. I worked on the garnish section, which meant I was in charge of the preparation and cooking of vegetables and herbs for the hot section. Through this section, I mastered in speed and organization. One has to be quick and know what one’s doing. The menu had 13 hot dishes for 40 covers, so the orders came in pretty quick. After working abroad in the past few years you moved back to your home island Malta, how did this feel? Did you consider staying abroad? It was awkward at first and I found it difficult to fit back in to the routine. In the 4 years I’ve been cooking, I struggled to find the right place for me to work, and that is why I bounced from one job to another, leaving the country and coming back. I have finally found a place where I feel I can make use of the skills I have developed along my journey. I do get the urge to go back and work abroad as the opportunities for learning are much bigger there. Malta is a very small island with limited opportunities, but at the end of the day this is the place I call home. I cannot see myself being away from this island for a long time. I am currently working at Tartarun restaurant & lounge. I am a chef de partie on the Cold / Pass section. 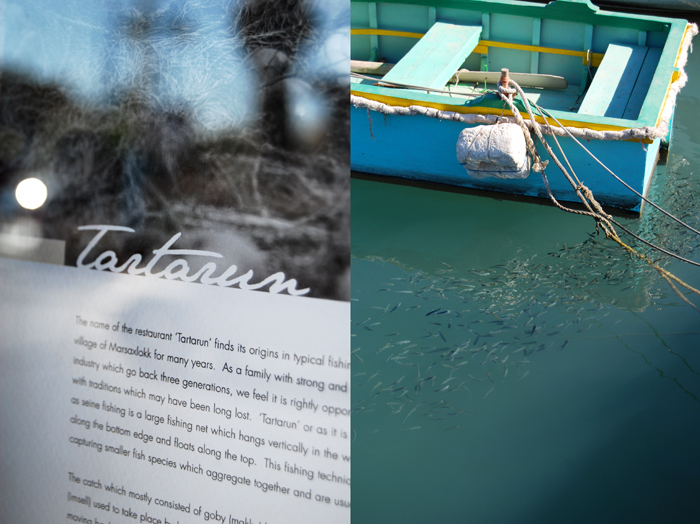 This is a fish-driven restaurant, which is much different to what I have experienced before. Nevertheless, I find it very interesting. Here I can develop my skills on how to handle fish properly. The management in the restaurant gives us a lot of free will to come up with daily specials, so for me this was a very big step to further develop my skills with regards to fish. Your father is a butcher in the 3rd generation, did you ever consider following this family tradition and why did you decide against it? My father owns his own business at the abattoir. He buys cattle and slaughters it, and sells to butchers across the island. To be quite honest, I was petrified of my father’s job when I was a young kid! I still remember the first time going with my father to the abattoir and watch them slaughter a cow. It was quite a shock to me at that age and it pushed me away from continuing my father’s line of work. Today, I have a deep respect for what my father does, and I love the art of butchery, which I think is a lost art since most of the meats that are purchased today come pre butchered and in vacuum bags. It is something which I keep close to my heart. I would rather get in a whole pig, butcher it and utilize all of it, rather than buy pre butchered meat. I guess I am still keeping a bit of the family tradition going on! The other factor is that it is a dying trade. Malta is a very small island with little-to-no pasture land for cattle to grow on. Most butchers nowadays buy their meats from wholesale importers who bring in meats from all over the world, as most of the times, the price is cheaper and they can not compete within the local market. Who was your biggest influence in the kitchen and why? The biggest influence on me becoming a cook has to be my grandmother. Prior to getting married, she was a nun, cooking in monasteries in Belgium and Italy for foster kids. She then married my grandfather and raised a family. Food was and still is family time in our households. She is 83 years old today and still cooks everyday for her kids, Wednesdays are our days to go and have lunch at grandma’s house. She has a large garden which she grows most of the vegetables she cooks, and this really is something which I love. Growing your own produce, harvesting it and cooking it for people, how better can it get! I try to cook food that is, first of all, delicious but at the same time sustainable. I like to cook depending on the seasons, and not use produce imported from across the world with little-to-no flavour. My experience from In de Wulf has influenced my cooking quite a bit. What I have learnt there, I am utilizing in my cooking now. Food there was always light and does not weigh you down; they focused a lot on vegetable cooking which is something that I try and do. I try to balance my dishes by using fresh herbs and acidity to make food seem lighter. 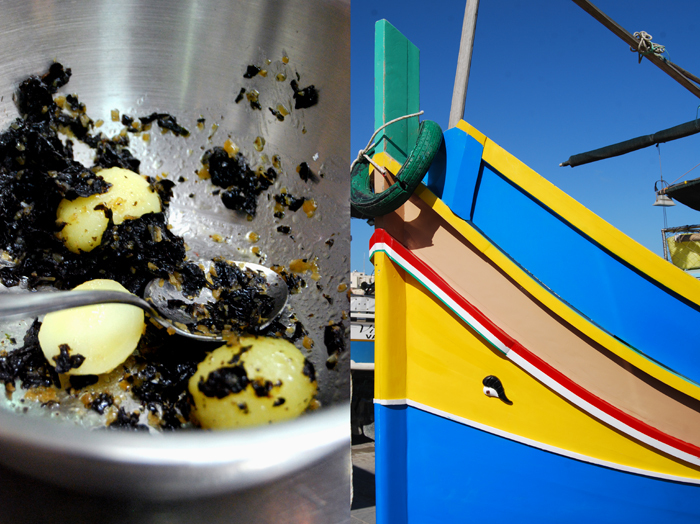 I am also experimenting with fermenting which is something we do not do in Malta and I find the flavours to be amazing. I have a couple of items fermenting in my kitchen cupboard which sometimes work and sometimes don’t, but that is a learning curve for me. I learn from my mistakes and keep notebooks with my experiments. In my cooking, I try to fuse the old and new style of cooking, always focusing on the produce first, then the technique. If it doesn’t taste good, then technique is a waste of time. It has to taste good first and foremost. I am also interested in Japanese cuisine mostly Kaiseki. The way they balance flavours and the discipline in perfecting their food is something that fascinates me. The first dish I cooked on my own has to be veal parmeggian; which involves veal escallops coated in breadcrumbs and pan fried, then coated with a tomato sauce, mozzarella and parmesan and then baked in the oven. This was around when I was 13 years old. My first food memory has to be my grandmother’s oxtail soup. I still crave it and always hope that grandma will cook that when we go over for lunch. It is a simple household dish which has deep flavours from the vegetables and the oxtail. Just thinking about it makes me crave for it! Developing new recipes is not easy for me. I am not that type of person that can come up with something on the fly. I think about a dish, and try and picture it in my head before I actually start cooking. I start with the main ingredient I want to work with, then start finding things that pair well with the main ingredient. I then move on to the technique, and see which one works well with the selected ingredients. I write all my recipes out, and then start cooking and experimenting. Don’t get me wrong, there are times when an idea pops in my head, and it turns out right, but for the most part it involves a trial and error process. I get inspirations from various things, but mostly books and food blogs. I try and see what chefs from all around the world are doing and take inspiration from that. I take ideas, and then try and develop them in my own style. Nature also inspires me. When I have some free time, I love to go for walks by the seaside or fields. This clears my mind and let’s me think about some dishes I want do. I sometimes also find wild ingredients, which I can use in my cooking. The big dream is to have my own restaurant one day. I want to have a small restaurant, and the idea of a tasting menu intrigues me, as one can showcase his or her style in a progression. This is something which you rarely see in Malta, since most of the restaurants offer a la carte. I want to have a place where I can express myself on a plate in different progressions, rather than 1 plate. Also, a menu that is not tied down to what is written on it. For instance, if I have a carrots dish, and the carrots are not of good quality, then I won’t serve it, but adapt to something that is good at that time. At this point, I am aiming to work hard where I am, and gather as much knowledge as possible, further develop my skills and never stop learning. I love going to the farmers’ market in Ta’ Qali, where I can buy goods that are fresh and in season. Also, new ideas can spark up when I’m there, such as a new vegetable that I didn’t know about, or maybe a purveyor selling local honey. 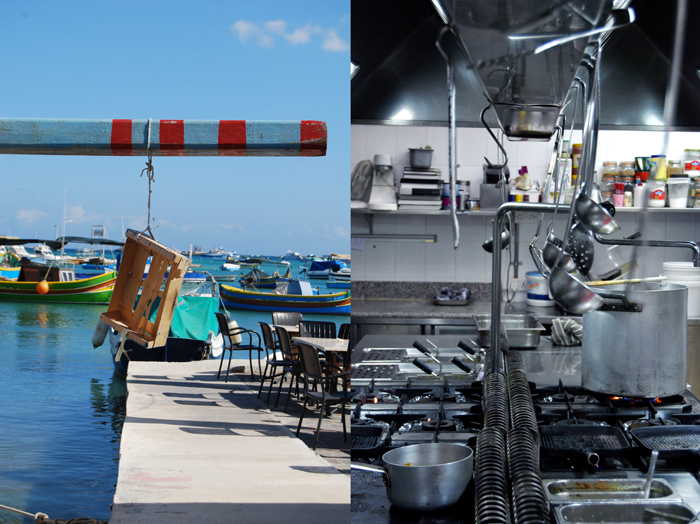 I love cooking but on my days off I’d rather go and eat out, and my favourite places in Malta have to be Black Pig and Il- Horza, which are fine dining restaurants serving really good food. Sammy’s by Culinary Forward Malta is doing really interesting work, as it is the first restaurant I know of that is purely local, for really good fish I’ll go to Tartarun restaurant, even though it’s my work place I don’t mind going for some good fish and lastly Ali Baba, which is a middle eastern restaurant with mind blowing food. I have decided to do a seasonal fish dish, to showcase where I am at right now in my journey. The dish is a local octopus which is grilled, served with raw fennel, marinated in its own juice and lemon, a squid ink emulsion using the cooking liquor and ink sack from the octopus hence utilizing the whole animal once again; together with baby potatoes coated in a seaweed paste to bring some earthiness, and some fresh seasonal herbs to balance and keep the dish light. With this dish, I will try to balance the land and the sea, which I think reflects Malta, since it is an island with bounties from the sea and land. If you could choose one person to cook a meal for, who and what would it be? My grandfather. Unfortunately, he passed away before I became a chef. I have deep respect for him, for the man he was. He loved food, especially meat. He worked in meat for all his life and never got tired of eating it as well. I would cook a nice steak with bernaise sauce for him and I’m sure he would love it! When I have time to cook at home, I tend to fall back on simple recipes, and one thing I keep on going back over and over to would be a Ramen – a nice pork broth infused with seaweed, some noodles, soft boiled, egg, roasted pork belly, seasonal greens and some pickles. Hits the spot every time! Still has to be my grandma’s oxtail soup, love that dish! Also, my mother cooks a pretty good lasagna, so those two dishes will be at the top for home cooked meals. 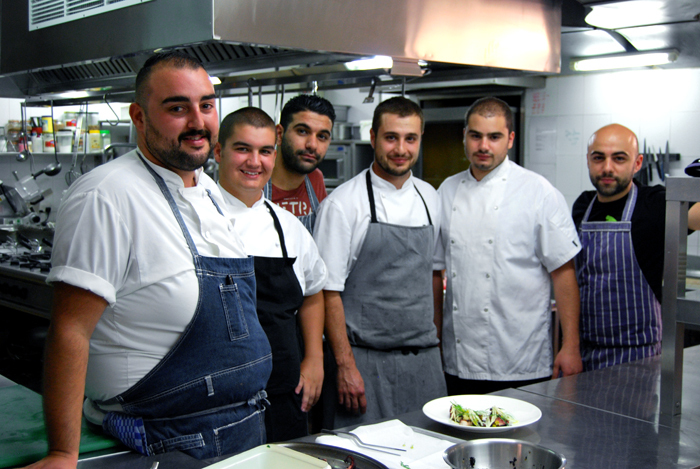 Working in a kitchen, I have learnt that it’s all about team work. You can’t run the show on your own. So yes, definitely with others. We all help each other out. Which meals do you prefer in your own kitchen, improvised or planned? When I’m at home cooking for myself, I’ll improvise, but when it comes to work I prefer to plan it out. i do not know if i am more excited about this dish as a whole or about what each of the components can bring to other dishes. kurt brings a bit of revolution to my test kitchen brain. instead of discovery channel’s shark week, i see this is fast becoming meike channel’s octopus week. i’m down.